Livestock in Botswana: By training farmers, processors and other stakeholders supporting agribusiness development, African talent can create new products and innovative processes that help feed African markets with African products (photo credit: ILRI/Saskia Hendrickx). Earlier this month, three agricultural economists working with the International Livestock Research Institute (ILRI) made presentations at the World Forum of the International Food and Agribusiness Management Association (IFAMA) in Cape Town, South Africa, 16–19 Jun 2014. The three scientists are Sirak Bahta, a German national of Eritrean origin, who investigates beef and small stock meat value chains and is stationed in Gaborone, Botswana; Jo Cadilhon, a French national researching livestock value chains, innovation platforms and agro-industries development in Africa and Asia, based in Nairobi, Kenya; and Kanar Hamza, a doctorate student from Iraqi Kurdistan studying at the University of New England (UNE), Armidale, Australia, who has been involved with ILRI in a beef value chain project in Botswana. Cadilhon’s participation was sponsored by ILRI’s Policy Trade and Value Chains (PTVC) team. The research and forum participation of Bahta and Hamza were funded by the Australian Centre for International Agricultural Research (ACIAR). At the Forum’s special session organized by the Rural Infrastructure and Agro-Industries Division of FAO and the University of Stellenbosch on Enabling Efficient and Inclusive Agricultural and Food Systems in Africa, Cadilhon, who works in ILRI’s Policy, Trade and Value Chains Program, presented lessons on fostering innovations to improve dairy production from a case study of Tanzania’s Tanga Dairy Innovation Platform. Cadilhon also took part in one of the Forum’s plenary sessions on Young Leaders’ Perspective where he provided key findings from a case study of a Ugandan woman entrepreneur, Lovin Kobusingye, who organizes and trains fish farmers in how to supply her with fish from which she produces novel, and increasingly popular, ‘fish sausages’ for a growing number of consumers in that country. The main lesson from the two case studies is that by training farmers, processors and other stakeholders supporting agribusiness development, African talent can create new products and innovative processes that help feed African markets with African products. Meanwhile, at the Forum’s Scientific Research Symposium, ILRI’s Bahta shared results from his analysis of the profit efficiency of smallholder beef farms in Botswana. His analysis confirms that better access to inputs and cropland increases farm profitability. Interestingly, this study shows that various factors like the gender of the farmer, level of education of the household head, distance to markets, and non-farm income, among many others, affect farm profitability differently depending on farm size. The levers needed to improve farm profitability and efficiency are thus different when targeting small, medium and large farms. 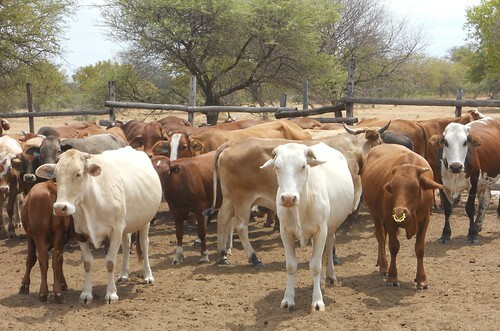 One implication of this is that some avenues for improving the efficiency of smallholder beef farms in Botswana exist without necessarily requiring changes in the current package of production inputs they are using. In another session of the meeting, UNE doctorate student Hamza, who collaborated with Bahta in the ILRI Botswana beef project, shared results from a systems dynamics analysis of the beef value chains in Botswana. His analysis shows there is minimal benefit for Botswana beef value chain stakeholders to open up the chain’s current export monopoly structure without animal disease control (what is more, this liberalization of beef exports would likely antagonize the current beef exporter.) On the other hand, his analysis also shows that investments in better control of foot-and-mouth disease would increase the profitability of all beef value chain actors in Botswana. The research reported on here was funded by the CGIAR Research Programs on Policies, Institutions and Markets, Humidtropics and by the ‘Enhancing smallholder livestock competitiveness in Botswana’ project of the Australian Centre for International Agricultural Research (ACIAR). Tags: Beef, Fish, IFAMA, Jo Cadilhon, Kanar Hamza, Sirak Bahta. Bookmark the permalink. Work by FAO on enabling environments for Agro-industries development has revealed that the stable political environment is a precondition for the development of agro-industries. Therefore, I think it is not surprising that success stories of agro-industrial development in Africa come from countries with a stable political environment and steady economic growth. As far as I’m concerned, I consider the ILRI research my colleagues and I presented should help in providing evidence, or at least hints in the case of the Kati Farms case study, that this stable political and economical environment are needed for the private sector to thrive and thus pull out smallholder farmers into market participation. Hoping that blog posts like these and related comments like yours encourage policy makers to read our work or engage with us so as to understand better how they could encourage agribusiness development in their country.